Note: To view enhanced versions of each image in another window, click on the image. 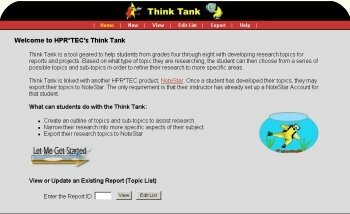 One of the primary goals of ThinkTank is to teach students how to create research topics and subtopics based on an assigned subject. To do this, we provide a simple wizard-like tool in which students may build their list of topics that shows a progress from subject to appropriate topics and subtopics. When you first arrive at the ThinkTank Web site, you will be taken to the page shown above. From this page, there are two methods that you may take to begin the process of creating your list of topics and subtopics. Click the graphic which reads Let Me Get Started. Click the New link from the red navigation bar at the top of the screen. After choosing one of these two options, read the introduction and click Begin. The first page of the wizard is the Subject Page. Here, you may enter the main subject of your report as well as decide what type of subject this is. 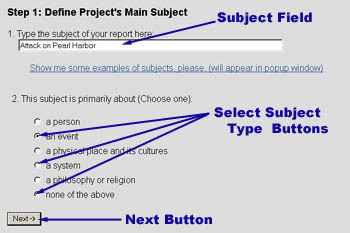 In the first field, type the subject of your report. Under the section labeled 2. This subject is primarily about..., you are given several options on how to describe your topic. Please select the option that is appropriate for your topic. To select an item, click the circle beside the item you wish to select. Once an item is selected, a black dot will appear inside the circle. When finished, click the Next -> button to continue. This page gives you the option of narrowing your research to a particular aspect of your subject. The list of topics given will provide some hints at topics you may wish to choose for your report based on your subject. Review these topics and choose which best describes what you wish to write about. Once you have decided on the appropriate topic for your paper, select it from the list. This page allows you to narrow the previously selected topic into narrower subtopics. These subtopics could easily make up part or an entire body paragraph of your report. Unlike many of the previous pages, you can select more than one subtopic from the list and even create your own. Review the list of available subtopics. Select the topics that you feel would most likely support your subject. Once you have selected your desired topics, select these items from the list. To select an item, click the square beside the item you wish to select. Once an item is selected, a black checkmark will appear inside the square confirming that it is selected. If you wish to add a custom subtopic, type it into the Custom Subtopic Field at the bottom of the page. Next, click the checkbox beside it to confirm that you wish to use this topic. This page is a bit more complicated than the others. It contains one primary component known as the Random Topic Generator. In the Current Topic List, you will find your up-to-date list of topics. This list will be updated whenever you add a new custom subtopic. First, review your list of current topics. If you feel that the list of topics and subtopics is sufficient, you may proceed to #3 below. The random topic generator produces the first half of a new topic. If you like this topic starter, fill in the rest of the topic in the New Subtopic Field and click Add New Subtopic. The Current Topic List will now update. If you do not like the current start of the random topic, click the New Subtopic Button to get a new subtopic starter. Once you are finished adding topics, you now have two options. To save and view your list of topics, click the Save and View Your Topics button. This page allows you to enter information into our system so that you may later retrieve your saved topics list. Enter in your zip code into the Zip Code field. In the two password fields, enter and re-enter your password. Once you are finished, click the Save and View button. If you have changed your mind about saving, click the Do NOT Save - Just View button. This page will appear to give you information on your saved topics list. 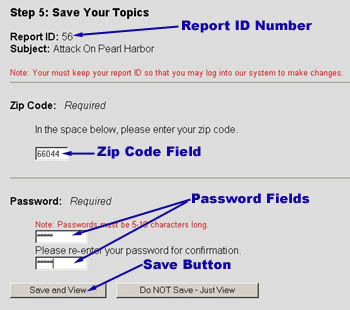 The Report ID is the ID number you will use to access the system later to export or edit your list. PRINT THIS PAGE. Click View Topics, when you are finished viewing this page. Here is your list of topics. If you want a more printer friendly copy of this list, click the Print View button.